If you’ve ever had a cat sit in front of your computer screen and use their paw to bat at your mouse as you move it around, you know probably how the idea for iPad games for cats came to be! 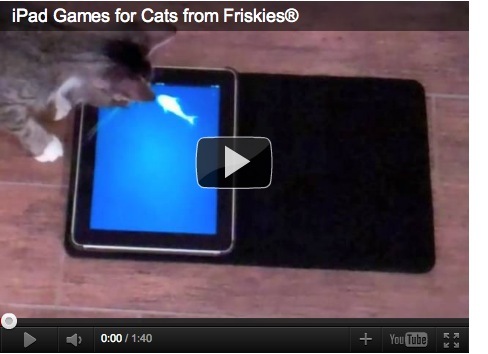 Purina® Friskies® Presents iPad Games for Cats which are really well done – and free! They have four games developed for the iPad – “Cat Fishing,” “Tasty Treasure Hunt”, “Party Mix-up” and a brand new one called “Litter Bug” for those of your four-pawed friends that love to be on bug patrol! They say these cat games are based on research of cat senses and how they react to different stimuli. We tested them out with our own resident felines and had the expected results: our senior cats gave us their best ‘what now’ look and went back to their more important duties of supervising the couch, grooming or a nap, while our young foster kittens thought the games were, well, the cat’s meow! Curious to see how your cats react? Visit http://www.gamesforcats.com for links to the games and to see videos of cats playing the games, always great for a few minutes of fun!